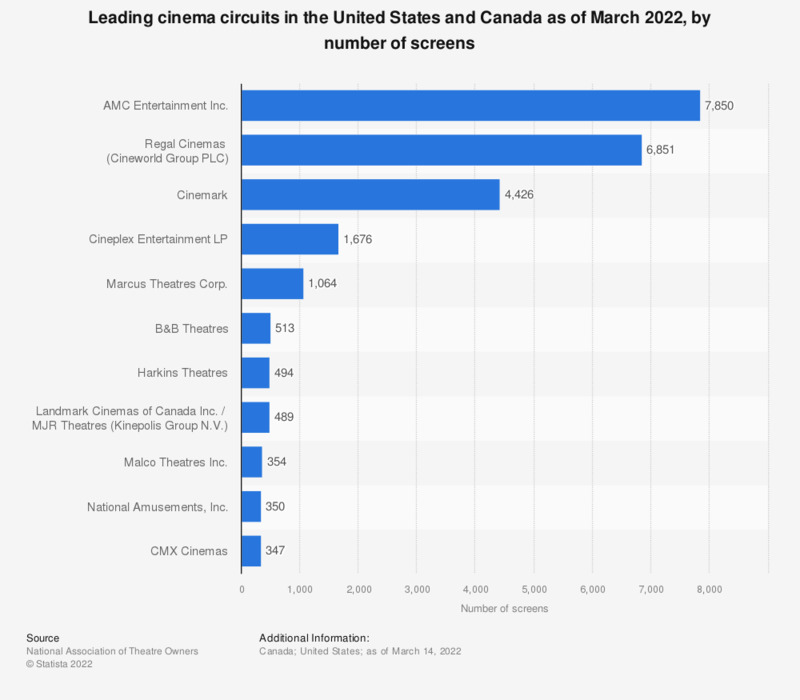 The graph shows leading cinema circuits in North America as of July 2018, ranked by number of screens. AMC Theatres ranked first with 8,218 screens. Total attendance at AMC Theatres worldwide reached record levels in 2017, with over 346 million attendees. This led to the company announcing all-time high revenue of over 5 billion U.S. dollars for the year. AMC Entertainment Incorporated made headlines in May 2012, when it was announced that the Chinese conglomerate Dalian Wanda Group would buy the chain for about 2.6 billion U.S. dollars. The acquisition was completed in September 2012. AMC Entertainment was founded as AMC Theaters in 1920 and is currently headquartered in Leawood, Kansas. The Regal Entertainment Group was second in the ranking with 7,310 screens across the United States. The company was established in 1989 and is headquartered in Knoxville, Tennessee. It operates such movie theater brands as Regal Cinemas, Edwards Theaters, and United Artists Theatres. Regal Entertainment Group generated 3.16 billion U.S. dollars of revenue in 2017, down slightly from 3.2 billion a year earlier. The attendance at Regal Cinemas, however, decreased from 210.9 thousand to 196.9 thousand in the same timeframe. Cinemark USA, the third largest chain, had 4.54 thousand screens in the United States as of July 2018. The chain is owned by Cinemark Holdings, Inc., which operates in Taiwan and Latin America in addition to its U.S. business. The company was founded in 1984 and is currently based out of Plano, Texas. Cinemark’s revenue showed steady growth between 2006 and 2017, during which time the revenue more than doubled from 1.22 billion to 2.99 billion U.S. dollars. Attendance has increased as well, but not quite as spectacularly as the company’s growth in revenue.